WASHINGTON — Two House Republican leaders are backing President Donald Trump’s proposed Space Force, but key Republicans in the Senate aren’t sold on the idea, setting up a debate over establishing and paying for a new branch of the military. Majority Leader Kevin McCarthy of California told The Associated Press the proposal is a "smart way" to address growing investments by China and others in space. 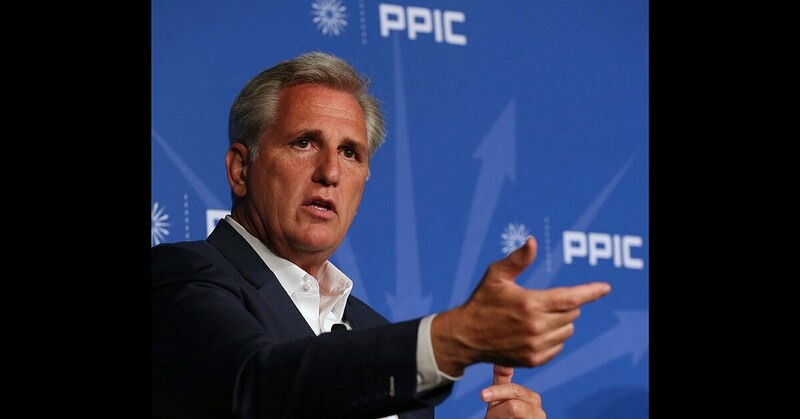 "We'd support that," McCarthy said in a brief interview in Sacramento, California. GOP Whip Rep. Steve Scalise, the No. 3 House Republican, also backs Trump's plan, an aide said Thursday. McCarthy and Scalise are vying to replace House Speaker Paul Ryan once he retires at the end of this term, if Republicans keep control of the House in the November midterm elections. Ryan has not commented publicly on the Space Force proposal. In the Senate, Trump's plan has received a cooler reception. Senate Majority Leader Mitch McConnell has not commented publicly on the Space Force and is awaiting more information from the Pentagon and the committees with jurisdiction, an aide said. The second-ranking Republican, Sen. John Cornyn of Texas, said he is skeptical of the idea. The Space Force would be the first new branch of the military since the creation of the Air Force in 1947. Congress would need to create and fund the new military service, which is expected to cost billions. The administration is preparing a formal legislative proposal and budget to be presented by the end of the year. Defense Secretary James Mattis was initially reluctant about creating a new force, concerned about a narrow operation and new layer of bureaucracy, but now is behind the president’s approach. In announcing the plan last week, Vice President Mike Pence described space as a domain that was once peaceful and uncontested but has now become crowded and adversarial. There is rising interest in the U.S.'s reliance on orbiting satellites for military and economic uses at a time when it has been reported that China and Russia are pursuing anti-satellite weapons for use during warfare. There are also growing worries that cyberattacks could target satellite technology. For now, space power is overseen by the Air Force Space Command, which is headquartered at Peterson Air Force Base in Colorado Springs, Colorado. Trump's proposal would consolidate operations under a new command, to be up and running by 2020. McCarthy said the idea is to make advancements as China and others increasingly invest in space. "What the Space Force does is focuses on space," he said, rather than "just sitting within the Air Force." McCarthy said "it would actually make a lot of good advancements for us, especially from technology." Congress recently authorized $716 billion for the military as part of the fiscal 2019 National Defense Authorization Act, which Trump signed into law on Monday. Convincing Congress to provide more money for a new Space Force could be difficult. The chairman of the Senate Appropriations Committee, Sen. Richard Shelby, R-Ala., was circumspect when asked about it. "My view on it this time, and it's early, is I think we ought to be careful," Shelby said. "We'll see what happens. Let's see what they're really proposing." Associated Press writer Alan Fram contributed to this report. Ronayne reported from Sacramento, California.